The soy protein market report illustrates data for 2018 (estimated year) to 2027 (forecast year), in terms of both, volume in MT and sales revenue in US$. The report comprises various forecast factors that impact the growth of the soy protein market. Market dynamics such as opportunities, drivers, trends, and restraints have also been included in the soy protein market report. Drivers impacting the growth of the soy protein market include increasing consumer awareness towards preventive healthcare, clean label trend, increase in the demand for fortified food, increase in the penetration of organic food in the global market, use of soy proteins in various sports nutrition, high e-Commerce penetration, soy protein being easier to digest when compared to animal proteins, and the consumption of soy protein leading to a reduction of fatty liver disease instances. There are certain restraints covered in the report too, such as acceptance of genetically modified crops being low in European countries, dairy protein has more advantages and more consumer acceptance, and false claims and negative publicity. These are some of the main factors that are hindering the growth of the soy protein market. Consumers focusing on acquisitions and mergers in the soy protein market, and increase in safety norms are expected to create opportunities in the soy protein market. Major trends governing the soy protein market include gradual increase in the popularity of vegan diets, presence of various plant proteins such as soy protein, increase in the number of health conscious consumers, and increase in the demand for premium and healthy food options, which are all directly pushing the growth of the soy protein market. 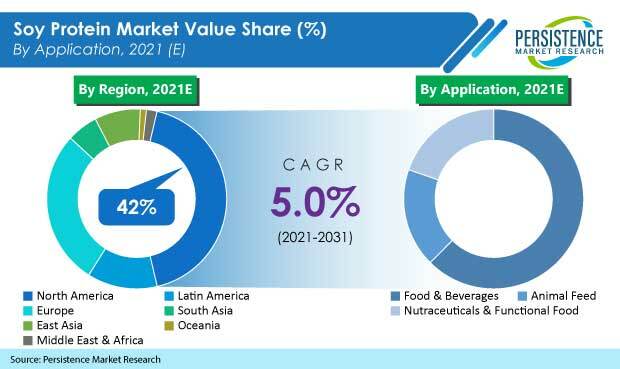 We have also included an outlook for the global food and beverage industry, major trends influencing the food and beverage industry, developments in the food and beverage sector, an overview of the food additives industry, and an overview of the soy protein market. The report also comprises a strategic overview, followed by a value chain analysis and key information of the prominent players operating in the global soy protein market, along with a detailed competitive analysis. This information will give a thorough overview of the soy protein market to the readers. The soy protein market report also includes market attractiveness analysis by end use, form, and region/country, along with absolute $ opportunity and incremental $ opportunity. There is a year-on-year growth trend covered in the report for every sub-segment. The report also includes market structure, and a detailed comparison between multinational players and regional players in the soy protein market. During the study of the soy protein market, our analysts observed that soy protein is largely used in the concentrate form, as this form contains a good amount of soy protein. By end use, the nutritional supplements segment is expected to account for a significant share of the consumption of soy protein. Soy proteins are used in other end uses as well, such as functional food, functional beverages, meat additives, nutritional supplements, animal feed, pharmaceuticals, and others. The report states that, soy protein finds large-scale application in the North America region when compared to other regions such as the Middle East and Africa, Europe, APAC, and Latin America. This disparity in application can be attributed to the increasing demand for nutritional supplements in the North American region. The report also consists of the company profiles of prominent soy protein manufacturers, and the revenue generated by these companies across five regions – Latin America, North America, APAC (Asia Pacific), Europe, and MEA (Middle Eastern and Africa). To evaluate the revenue of soy protein manufacturers, the average price of soy protein was obtained from various suppliers, manufacturers, distributors, and exporters through quotes. Key application segments of soy protein were considered, and the dynamic ones were projected on the basis of feedback from different secondary sources and primary respondents. Data points were collected and considered for the modelling approach, which includes the overview of the food and beverage industry, overview of food additive manufacturers, overview of the soy protein industry, outlook of the food and beverage industry, and the average purchase price of soy protein. Assuming that currency rates remain constant during the forecast period, the soy protein market value and volume were estimated. The soy protein market report also includes additional information such as health supplement trade scenario, global economic outlook, soy protein market volume analysis outlook, soy protein market trade outlook, key regulations in various regions, major trends in the food and beverage industry, an outlook of the food and beverage industry, forecast factors, and recent developments in the soy protein market. Various secondary and primary sources were consulted during the course of the study. Secondary sources include annual reports of major companies, recent publications, Factiva, and Hoovers. The soy protein market report also includes a detailed pricing analysis on the basis of product type for every region, and the trade scenario of soy protein. The trade scenario includes the data of top exporters and importers in the soy protein market. The report includes a detailed and descriptive competition dashboard of soy protein, which gives an overview of the companies that have been profiled. The regional presence of companies, revenue, product offerings, headquarters of companies, and the intensity of product types, ranging from high to low, are the points that are mentioned in the competition dashboard. A comprehensive competition analysis of the major companies in the soy protein market has also been provided in the report. This will help readers evaluate the long-term and short-term strategies, various product offerings, and recent developments in the soy protein marketplace. Some of the key players analyzed in the soy protein market report are Glanbia Plc, Archer-Daniels Midland Co., Cargill Incorporated, E.I. du Pont de Nemours & Co., Cosucra Groupe Warcoing, AGT Food & Ingredients, Inc., Ingredion Inc., CHS Inc., The Scoular Company, Fuji Oil Holdings Inc., Wilmar International Ltd., Ag Processing Inc., Batory Foods, Devansoy Inc., Crown Soya Protein, Shandong Yuwang Ecological Food Industry Co., Ltd., Gushen Group Co., Ltd., and Biopress S.A.S., among other soy protein manufacturers. Soy protein is a type of plant protein that is isolated from soybean. Soy protein is made from defatted and dehulled soybean meal. The obtained soy protein is processed into three commercial products - soy concentrates, soy flour, and soy isolates. Soy protein isolates are used in the food industry for their functional properties. Soy protein is usually known as concentrated protein bodies, and it has 60–70% of soybean protein content. Soy protein is used in various food products such as soups, salads, meat analogues, frozen desserts, non-dairy creams, cheese, whipped toppings, breakfast cereals, infant formula, pastas, breads, and pet food. These soy proteins provide essential amino acids for human nutrition. Soy protein is important for vegans and vegetarians as it has high protein content when compared to the other plant-based proteins. Soy Protein Isolates - Soy protein isolates are refined soy protein comprising 90% protein content. These are widely used in infant foods, dairy replacements, meat systems, weaning foods, and functional foods. Soy protein isolates represent the second-largest product segment in the global soy protein market. Soy Protein Concentrates - Soy protein concentrates are another type of protein ingredients consisting of 70% protein content, and this segment has the maximum market share in the global soy protein market. They are widely used as protein ingredients in functional or nutrition food products, mainly in baked foods, breakfast cereals, and in some meat products. Other Soy Proteins - Other soy proteins such as hydrolysates are produced through the hydrolysis of various animal and plant proteins, have 40-60% protein content, and are widely used in manufacturing animal feed, cattle feed, and poultry feed. A majority of the U.S. population is health conscious, and is aware of the benefits of preventive healthcare. Various online forums and magazines such as bodybuilding.com, livestrong.com, Shape magazine, and men’s health magazines offer diet and lifestyle information, and provide regular updates in this regard. Similarly, manufacturers of natural ingredient-based proteins are promoting various products using various channels such magazines, online portals, and marketing campaigns to fuel the demand for plant-protein-enriched products. These marketing strategies primarily focus on new products offering enhanced effectiveness, safety, and health benefits such as the ability to lower body weight, lower cholesterol, and lower blood pressure levels. This is expected to aid market growth in the region. Soy protein has shown positive effects on obesity-related conditions such as inflammation and fatty liver disease. Fatty liver is a risk factor for cardiovascular disease, and is observed in people who are obese. Soy protein reduces LDL (bad) cholesterol and increases HDL (good) cholesterol, supporting heart health and cholesterol-lowering claims that are approved in 12 countries around the globe. The demand for soy protein-rich food has increased, owing to its capability to aid in reducing higher-than-normal blood cholesterol levels. A study was conducted by the National Center for Biotechnology Information (NCBI) in 2011 on genetically obese and lean mice in order to determine the effect of soy protein caseinates, dairy whey proteins, or soy protein isolates on obesity-related metabolic dysfunction. It is a type of condition that exists in people who are obese and overweight, and this condition might cause type-II diabetes mellitus. Researchers observed 40% liver weight reduction in obese mice fed with soy protein when compared to caseinate and whey protein. Over the past few years, there has been an increasing shift towards vegetarianism, globally. This trend is expected to positively affect the demand for plant-based products such as plant-based proteins. In 2008, according to the Vegetarian Times Magazine, over 7.3 million adults in the U.S. were vegetarians, which is 3.2% of the total population. Plant protein has become a replacement for other proteins such as whey protein, meat protein, egg protein, and others due to the increasing vegan trend. Soy protein gained popularity when Hampton Creek (food company) used soy protein as a substitute for egg protein in products such as mayonnaise and its Beyond Meat’s product, and also used soy protein with non-genetically modified soy in its chicken-free strips product. Europeans prefer high protein diets in comparison to the populations in other regions. A European’s regular diet comprises more than the recommended amount of protein prescribed for maintaining ideal health. This has led to the increasing demand for plant-based proteins and protein-rich products. According to the World Health Organization (WHO), the average protein consumption of Europeans ranges between 99 to 115 gm. per day.